FOX is headed back to the Hollow. 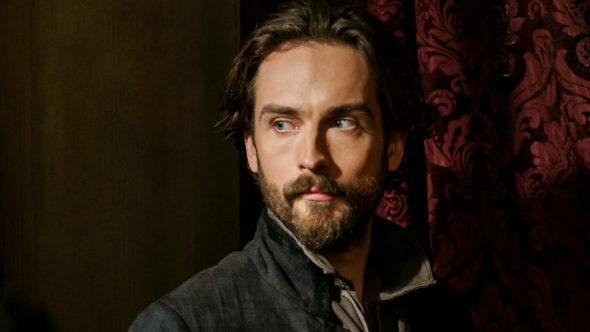 Today, the network announced they’ve renewed Sleepy Hollow for a fourth season. The supernatural series follows Ichabod Crane (Tom Mison), a Revolutionary War hero who comes back to life after more than two centuries only to find himself solving mysteries with police lieutenant Abbie Mills (Nicole Beharie). Lyndie Greenwood, Shannyn Sossamon, and Nikki Reed also star. The renewal is somewhat surprising, considering [SPOILER AHEAD] season three ended with the death of the series’ co-lead, Abbie Mills. Fans were outraged. However, the show’s executive producers have apparently already made plans for the future. Additionally, ratings for season three dropped significantly for the drama. The season averaged only an .83 rating in the 18-49 demo and 3.065 million viewers. For comparison, season two averaged 1.55 in the 18-49 demo, with a total of 4.57 million viewers. What do you think? Are you a fan of Sleepy Hollow? Will you watch season four without Abbie? but this and (sorry to say) Grimm are the best! Yes, I love the show, can’t wait for season 4 to start!!!!!! Happily looking forward to Season 4. Abbie will be missed(but she has to do what’s right for her) very much but I’m sure they are planning to keep us interested with lots of intense plots and new characters. We love Sleepy Hollow for two reasons. Tom Mison’s Ichabod Crane and all the Revolutionary War and American history references combined with the supernatural. The other characters can come and go and we will still love the show for these fundamentals. If I would suggest anything, the producers could do more to set the storylines in other historical plotlines, perhaps having Crane travel around to many of the different famous places in American history. Either way, we’ll be watching! Thanks Fox! I firmly believe you list a lot of people because you changed nights. Friday night is a tough night, personally I was ready on Monday nights to just sit at 9pm but I missed most of season 4 because of the change. I love the show the concept is great , merging historical facts and imagination, makes a person wonder which is real or not. History is not an important academic anymore this peaks the interest again. We have had great conversations started because of what was seen on the show. Don’t lose that! Of coarse i will continue to watch as I have from day one. It’ about Ichabod Crane Tom Mison. It will be fine.